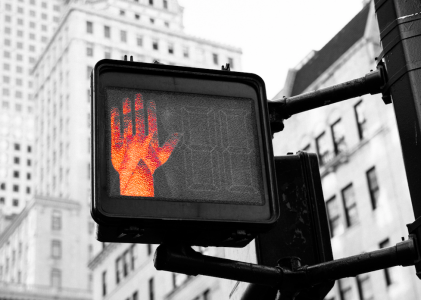 Our latest webinar discussing the do’s and don’ts when it comes to SEO and PPC, brings together some of the best in the business, with Krista LaRiviere from gShift and our very own Marc Poirier. Founded in 2009, gShift is a digital marketing firm devoted to helping marketers improve brand discoverability through organic search, content performance and social networks. Krista LaRiviere heads gShift as CoFounder, CEO and Chairperson. She has also been on the Board of SEMPO for years now, was listed as a top tech influencer and has won over crowds at some of the largest marketing events worldwide. Acquisio and gShift are complementary marketing channel-tech solutions and as we all know PPC and SEO go hand in hand! Acquisio and gShift are thrilled to come together and bring you the biggest yea or nays in the industry! If you missed the webinar, go listen to it! But if you’re feeling all TLDL about it you can read a summary here – we won’t judge you. Krista LaRiviere believes SEO should stand for “Strategies for Earned and Owned.” She believes marketers need to relearn how they think about this channel. SEO should be about creating long-term strategies based on discoverability, she says, and not just using a few basic techniques to “optimize” a piece of content. In the context of rethinking SEO, let’s talk about what to DO first. Optimize content for mobile rather than desktop. Google seeks out and indexes mobile-ready content first ahead of desktop, since the number of mobile users has increased exponentially. gShift offers mobile keyword data to help marketers understand how their brand performs on desktop vs mobile. If your content isn’t optimized for mobile devices, you’re missing out on a lot of visibility. Whether optimizing on a mobile or a desktop device, the second do is to always write for people and not search engines. More and more businesses are investing in content marketing and learning how to write content for their audience. Think about the content mix in your content strategy and how your audience consumes content. Marketers need to consider different stages of the buying cycle in addition to factors like different devices. Marketers have to make sure content is optimized and give a lot of thought to how it’s all interconnected. As users change the way they search for things online, marketers can ensure they’re being discovered by adapting. Start optimizing content for voice search. A study by North Star and Google found that users across every age-group use voice search. Spoken search queries tend to be more conversational than searches done with a keyboard. It’s time, then, to start thinking about natural long-tail keywords that may be used to find your content, company, or brand. Understand how your audience searches for your brand’s products in a conversational way when they are talking into their mobile device. From our SEO Do’s section above, we know that we shouldn’t just write a post to stuff it with keywords for the purpose of ranking in search engines. It should always be about the user! Never, ever, stuff a specific keyword in any piece of content be it a blog or a page on your website. Keywords need to actually fit into content headings and text naturally. Instead, try choosing a stem phrase then build out various long tail keywords around it (these work for Voice keyword research as well). Then use those variations throughout your page and content. That goes for content on your website and content you’re writing on other websites. Guest posting is another area of SEO that has come and gone. While it is still useful in the context of adding value to reputable sites relevant to your brand, do not guest blog just to get backlinks. Guest blogging is more about discoverability and NOT about backlinks. And it goes without saying, definitely don’t pay anyone to guest post on their site. It’s shocking that we still have to tell marketers not to purchase a link on someone else’s website, considering the JC Penny take down was in 2011. 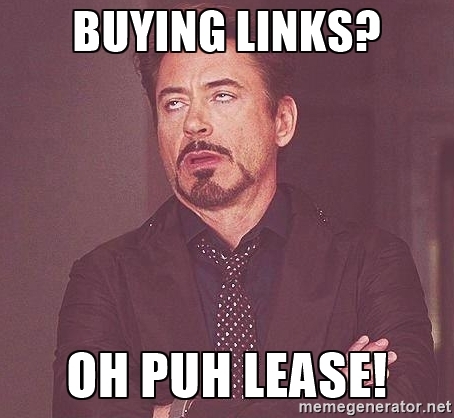 Do not buy links ever! Buying backlinks is not beneficial to discoverability, LaRiviere stressed during the webinar. The practice of buying backlinks is considered “black hat” SEO, something Google penalizes websites for with their Penguin algorithm update. Marc Poirier spoke about PPC wins during the webinar. He says marketers should only be using one URL pathway when creating ads. The new expanded text ad (ETA) headline gives marketers the ability to define more than one URL pathway, but this is a mistake. A study cited in the webinar showed that having the shortest URL pathway can increase CTR by 35%, so tighten up the URL and stick to it. 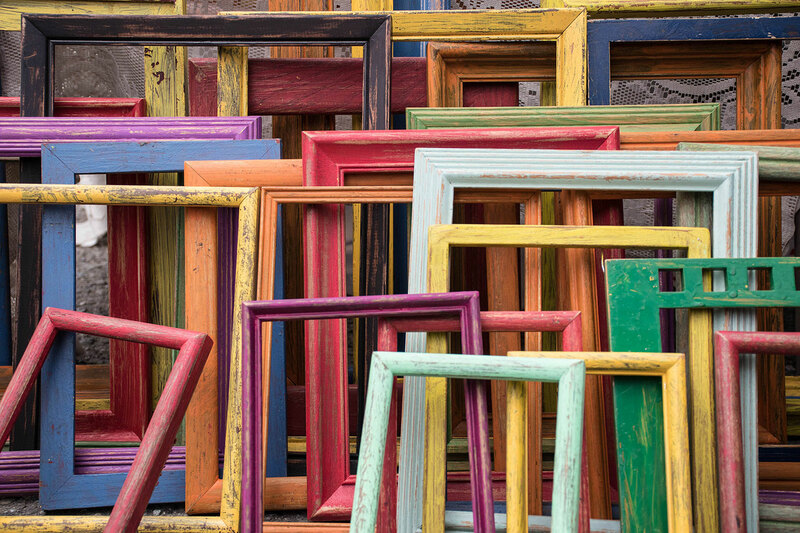 The second must-do for marketers is to make use of callout extensions. Seen in the image to the right here, call out extensions are widely underused and can increase click-through-rate. The ads are bigger, they say more and they can even be scheduled. In fact, making use of extensions in general will improve performance, especially next to competitors already using these. Finally Marc recommends that PPC marketers should make use of very tight ad groups, with no more than 10 keywords in each. This practice of very narrow keyword groups is a strategy now known as the single-keyword-ad-group (SKAG). While SKAGs help marketers maintain control over ad groups, this is a difficult strategy to scale. Being first in Google shouldn’t necessarily be your goal and marketers too often perpetuate this myth. Poirier says avoid gunning for first place all the time as this strategy will only burn out budgets without much return. Average position is an indicator of high performance yes, but the truth is that you’re trying to get conversions and clicks for a given budget. Companies should be focusing on maximizing their budget, their ROI and profits for impressions. Too often we hear agencies say we don’t care about optimization we just want to be #1, which is crazy. Marc also warns about Dynamic Keyword Insertion (DKI) practice. Do not use DKI at large in PPC, use it with caution. While it can be a useful tool, you may end up with ads that don’t make any sense at all like the ones shown in the image to the right. Even though sensational headlines may increase click through rate, if these clicks are for sheer entertainment-value they end up just costing marketing a lot of money for nothing. Marketers need to stay in control of keyword placement in paid ads and focus on conversion not clicks. Marketers also need to control conversions by developing a greater understanding of them. Not all conversions are created equally. Don’t get caught measuring the wrong conversions. Someone who downloads a white-paper doesn’t necessarily want to talk to a salesperson for example. Similarly B2C products can have very different values attached to them. Marketers need to analyze the value of each type of click to make sure they’re paying the right price for them. This analysis can be done in a bid optimization tool. The point is to implement systems that will give you feedback on the ROI of different conversion types. Finally when it comes to bidding on keywords, we can’t forget our own company identity. Don’t forget to bid on brand terms. Avery labels decreased their campaign costs by 51% by buying their own branded keywords. This also raised the cost of these keywords and stopped their competitors from bidding on them. 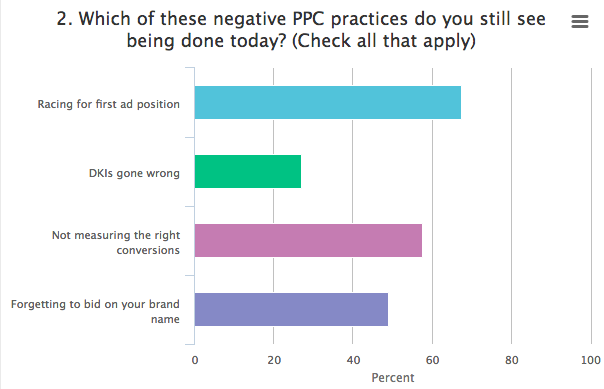 PPC campaigns that bid intelligently on brand name keywords do better than those that don’t. An integrated approach to digital marketing can make good things happen to good marketing teams. SEO and PPC work in tandem to create new levels of marketing success. As you begin to understand this relationship you may want to invest more in PPC and vice versa. Making use of both the pay per click and the search engine optimization channel also increases your ability to compete with other brands in your industry. Break down all of the silos in the marketing department to ensure your digital channels can work together. Look at your entire web presence across paid, owned and earned with consistent monitoring to understand how to improve your brand’s discoverability. Follow the SEO and PPC sins and wins guide above to get the best results. 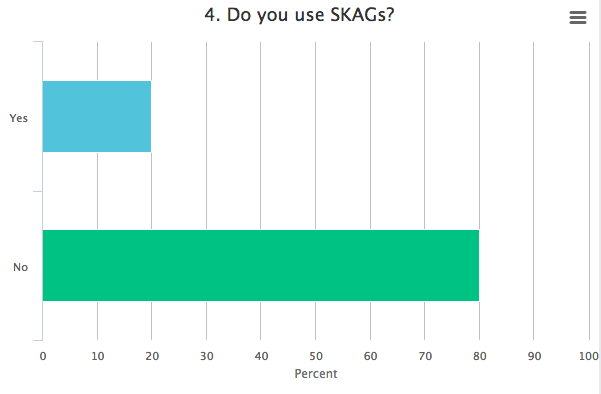 During the webinar we polled our audience to get some feedback data on the topics we discussed. Here are the results you gave us! 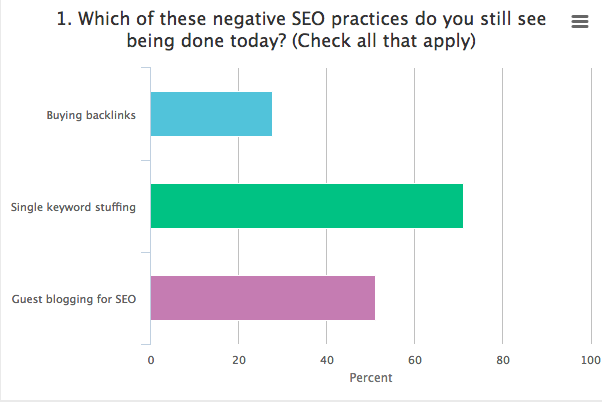 Audience Answer 1: 65% said single keyword stuffing! Audience Answer 3: 82% said no. 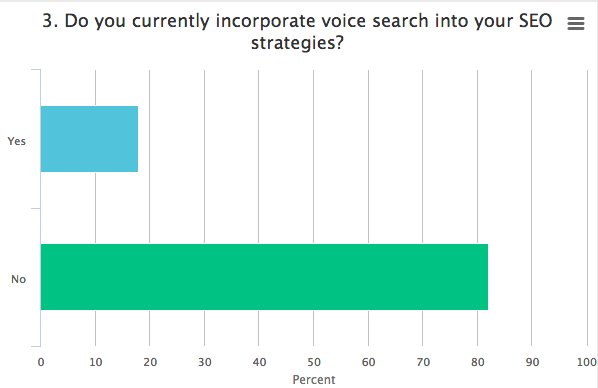 How do you do keyword research for voice search? How do you determine the ratio of spend for branded versus non-branded keywords? If you want the answer to these questions and more make sure you get a copy of our webinar and listen to it! Your 21 Facebook Advertising Questions Answered!